Media releases (images, photos and video) are also available. For other news and events visit the public releases archive. "William Herschel, Astronomer and Musician"
"Una nueva vida para los telescopios Herschel y Newton"
"Con el William Herschel y el Satélite Gaia Trazaremos un Mapa de la Vía Láctea del Siglo XXI"
Presentation of the Conference "Multi-Object Spectroscopy in the Next Decade"
Conference on "Multi-Object Spectroscopy in the Next Decade"
Conference on "Multi-Object Spectroscopy in the Next Decade". First Announcement. 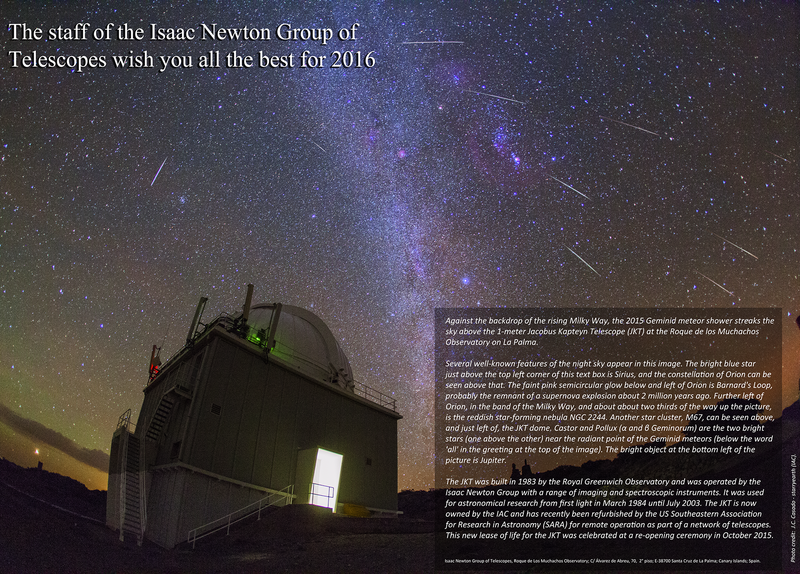 Best Wishes From La Palma! 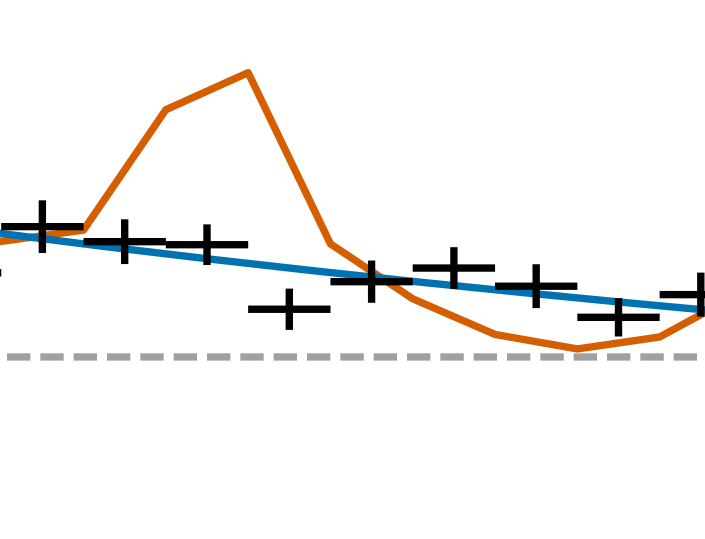 Seminar at ING: The QSO HE1013-2136 (z = 0.785): tracing the ULIRG - QSO connection towards large look-back times? 22 December 2005. University of Utrecht will lead the construction of a high-accuracy polarimeter for direct exoplanetary detection at the WHT (in Dutch). 19 November 2005. 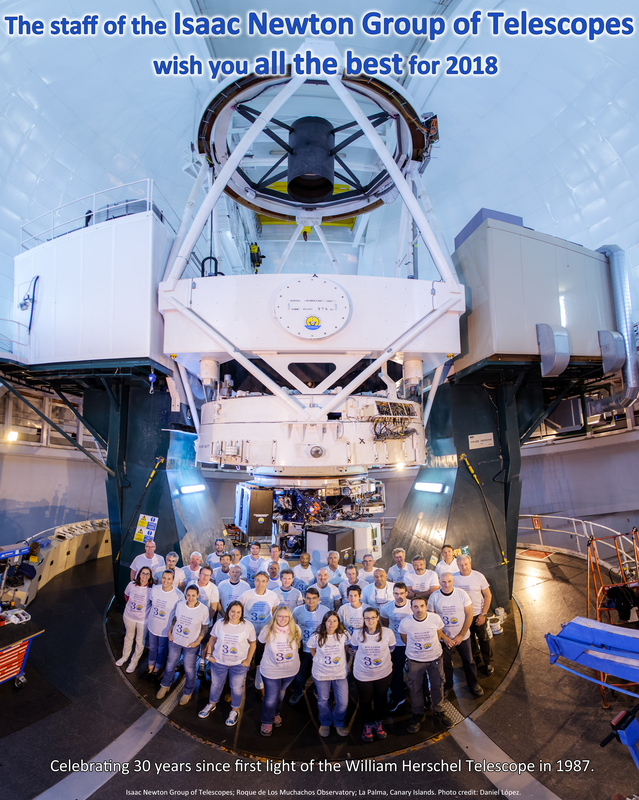 ING participates in the European Science Week dedicated to Einstein's theory of relativity on La Palma. 14 November 2005. Seminar at ING: New developments in CCD technology. 27 October 2005. SWIRE: Piecing Together the Universe's History with Wide-Infrared Eyes, using data from Spitzer Space Telescope and the Isaac Newton Telescope. Image release. 24 October 2005. Seminar at ING: Features and performance of the Copenhagen generation 3 array-controller. 14 October 2005. Specialist Discussion Meeting on "Science from La Palma - Looking beyond 2009", at Burlington House, London, organised by the Royal Astronomical Society and ING. 28 September 2005. Secretos de la Vía Láctea . IAC Press release. 23 September 2005. Seminar at ING: Old open clusters as tracers of galactic chemical evolution. 20 September 2005. New star survey sheds light on the evolution of galaxies using INT's WFC. Imperial College Press Release. 7 September 2005. Seminar at ING: Extreme clumping in the winds of Luminous Blue Variables . 26 August 2005. Seminar at ING: OB associations in the era of planet formation. 23 August 2005. 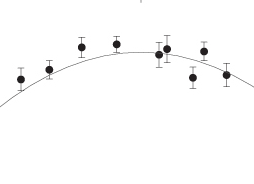 Gas and Dust Properties in the Afterglow Spectra of the Third-Highest-Redshift GRB 050730 from WHT observations. 22 August 2005. ING Announcement of Opportunity for Observing Time in 2006A. 19 August 2005. Open Day for Garafía municipality. 13 August 2005. WHT Open Day. Online booking. 10 August 2005. Black Hole Blows Bubble Between the Stars, RAS Press Release. 4 August 2005. Voracious Black Holes Hide Their Appetite in Dusty Galaxies, PPARC Press Release. 30 July 2005. INT Open Day. Online booking. 25-30 July 2005. A course on Taller aplicado de investigación y observación astronómica en La Palma, organised by the Universidad Ambiental de La Palma and the Spanish distance learning university (UNED), with support from OPTICON Public Outreach. 18-19 July 2005. Visit of ING's international review panel. 14 July 2005. Superwind Discovered Spreading Star Dust across the Universe, PPARC Press Release. 9 July 2005. WHT Open Day. Online booking. 4 July 2005. Deep Impact at ING ! 2 July 2005. WHT Open Day. Online booking. 6-10 June 2005. 2nd Meeting on Hot Subdwarf Stars and Related Objects, organised by ING and NOT. 10 May 2005. "Más de 60 expertos de todo el mundo debaten en La Palma sobre una nueva técnica de observación astronómica". ING press release. 9-11 May 2005. Workshop on Adaptive-Optics Assisted Integral-Field Spectroscopy, organised by ING. 2 April 2005. Astronomers Discover Mysterious New Star Clusters, using the INT WFC. RAS National Astronomy Meeting Press Release. 23 February 2005. Seeing the invisible - first dark galaxy discovered?. PPARC Press Release. 19 January 2005. Top 2004 Scientific Highlights. 14 January 2005. LIRIS Observations of Supernova SN 2004ao. 12 January 2005. Spanish television's Redes programme on Roque de Los Muchachos Observatory shown on TVE2. 5 January 2005. New astronomy knowledge database. 4 January 2005. Spanish television's series "Un Programa Estelar" comprising six chapters about astronomy and observatories shown on TVE2 weekly. 25 November 2004. New telescope sheets available online. 8-14 November 2004. ING participates in the Science and Technology Week on La Palma, dedicated to astrobiology. 4 November 2004. ING Newsletter No. 8, September 2004 available online. 28 October 2004. William Herschel Telescope Identifies the Companion Star of Type Ia Tycho Brahe´s 1572 Supernova. 21 October 2004.The Cambridge Infrared PAnoramic Survey Spectrograph (CIRPASS) returns to the WHT. 15 September 2004. ING endorses the Washington Charter for Communicating Astronomy with the Public. 9 September 2004. ING astronomer observes dying star creates sculpture of gas and dust. ESA Press Release. 15 August 2004. Open Day at the Roque de Los Muchachos Observatory from 09:00 to 16:00. ING telescopes open to the public. Come and visit us!. 27 July 2004. First light on the new WYFFOS Long Camera. 25 July 2004. The Spanish Education and Science Minister visits the WHT. 18 July 2004. Open Day at the Roque de Los Muchachos Observatory from 09:00 to 16:00. ING telescopes open to the public. Come and visit us!. 13 July 2004. ING Biennial Report 2002-2003 available online. 6 July 2004. SCAM-3: Superconductivity is back to the WHT. 16 June 2004.The Instituto de Astrofísica de Canarias names a new nebula “Príncipes de Asturias” (Spanish crown princes). The planetary nebula PNG 126.62 + 1.32 was observed using the WFC on the INT. IAC Press Release. 8 June 2004. Venus Transit Observed at the Roque de Los Muchachos Observatory. 19 May 2004. 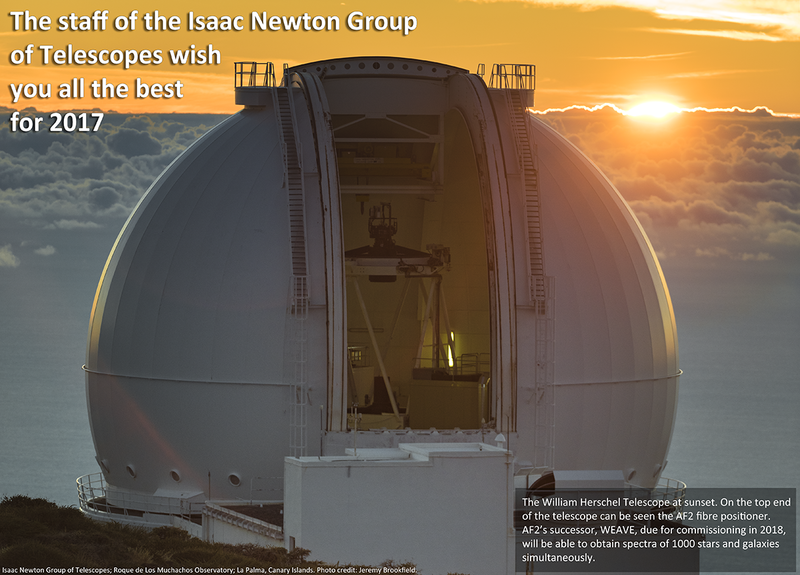 Nik Szymanek, ING's public outreach collaborator, receives the prestigious Amateur Achievement Award of the Astronomical Society of the Pacific. Text of the announcing press release. 26 April 2004. A Star is Born. LIRIS captures the impetuous birth of a star in the Orion constellation. IAC Press Release. 22 April 2004. 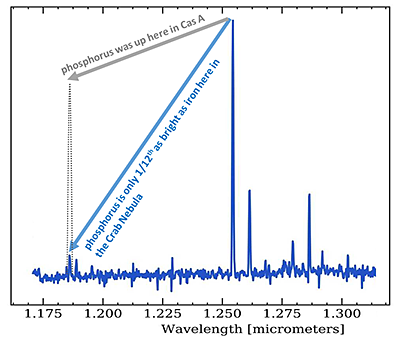 First light of PLANETPOL at the William Herschel Telescope. 16 April 2004. Inauguration of SuperWASP from ING's sea-level office remotely. 31 March 2004. Andromeda Galaxy - Cannibal on our doorstep?. 2004 NAM Press Release. 15 February 2004. ING Newsletter No. 7, December 2003 available online. 12 February 2004. M81 and SN 1993J's companion: Astronomy Picture of the Day. 10 February 2004. 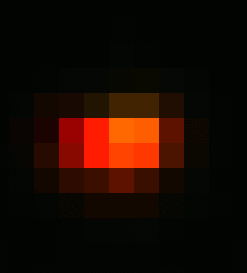 GLAS (Ground-layer Laser Adaptive optics System). A Rayleigh laser beacon for NAOMI . 9 February 2004.New Instruments give UK Astronomers Control of the Time Domain. RAS Press Release. 29 January 2004. 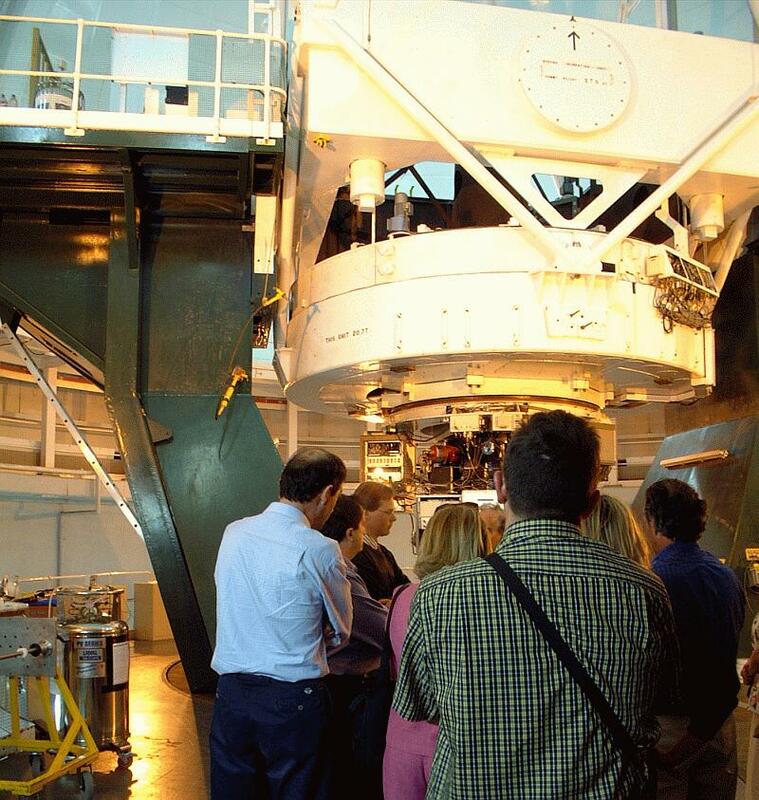 Spanish astronaut Pedro Duque visits the William Herschel Telescope. 26 January 2004. Massive Old Star Reveals Secrets On Deathbed. ING Telescopes involved in supernova progenitor discovery. PPARC Press Release. 12-14 January 2004. Course on Adaptive Optics organised by ING. 9 December 2003. Viaje al Centro de las Galaxias. Un Científico del IAC confirma un mecanismo para "alimentar" a los agujeros negros de los centros galáticos. IAC Press Release. 22 October 2003. Tour the ING!. A photo tour of us. 10 October 2003. Inauguration of MAGIC and Mercator telescopes. Congratulations to our colleagues!. 2 October 2003. ING Annual Report 2000-2001 online. 8 September 2003. The collection of ING library's duplicates donated to Biblioteca "José Pérez Vidal" of the Excmo. Cabildo Insular de La Palma. 6 September 2003. ING supports the "Sociedad de Estudios Generales de la isla de La Palma", a society to promote general research on La Palma and communication between local investigators. 25-26 August 2003. Enjoy Mars! ING collaborates with the local amateurs in talks and public observations of Mars. Poster. 23 August 2003. BBC's live broadcast from INT: The All Night Star Party!. 18 August. Los telescopios del Observatorio del Roque de los Muchachos reciben unas 3.000 visitas en la Jornada de Puertas Abiertas del pasado 15 de agosto. IAC Press Release. 15 August 2003. Open Day at the William Herschel Telescope. 28 July 2003. Jornadas de Puertas Abiertas en el Observatorio del Roque de Los Muchachos. IAC Press Release. 21 July 2003. Thomas Hardy School from Dorchester (Dorset, UK) observes on the JKT. 24 June 2003. School Students set to Discover Exploding Stars in Distant Galaxies, using images from the INT. 6 June 2003.The Spanish Science and Technology minister visits the WHT. 26-30 May 2003. Satellites and Tidal Streams Conference. ING-IAC Joint Conference. 28 May 2003. WASP prepares to search for a thousand new planets. PPARC Press Release. 27 May 2003.Vida Inteligente en el Universo - Conferencia pública en el Real Club Náutico de Santa Cruz de La Palma, miércoles 28 de mayo a las 20:00 horas. ING Press Release. 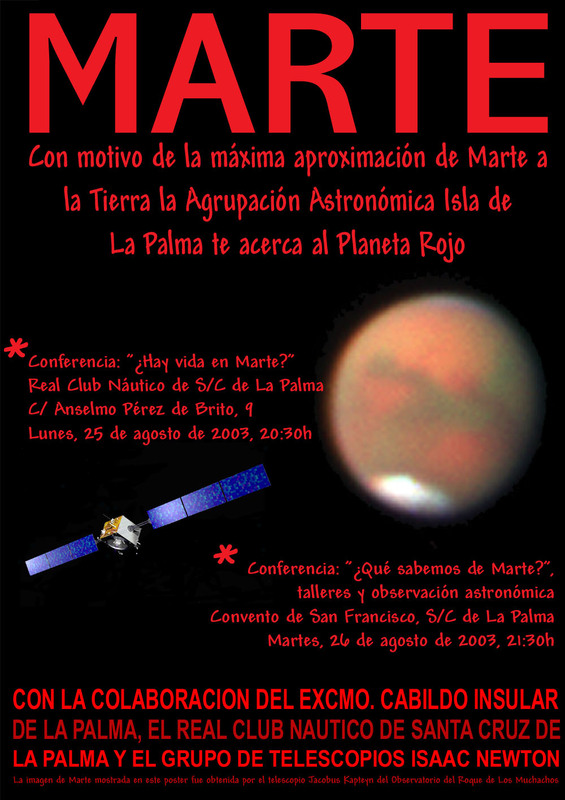 22 May 2003.Congreso Internacional de Astrofísica en La Palma. IAC Press Release. 7 May 2003. Mercury transit broadcasted in live on the web. 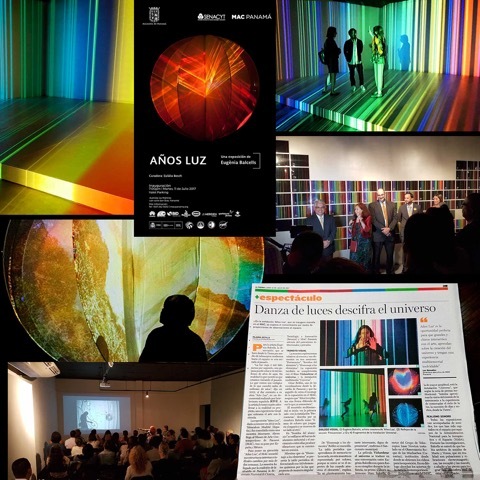 ING collaborates with the La Palma Astronomical Association. 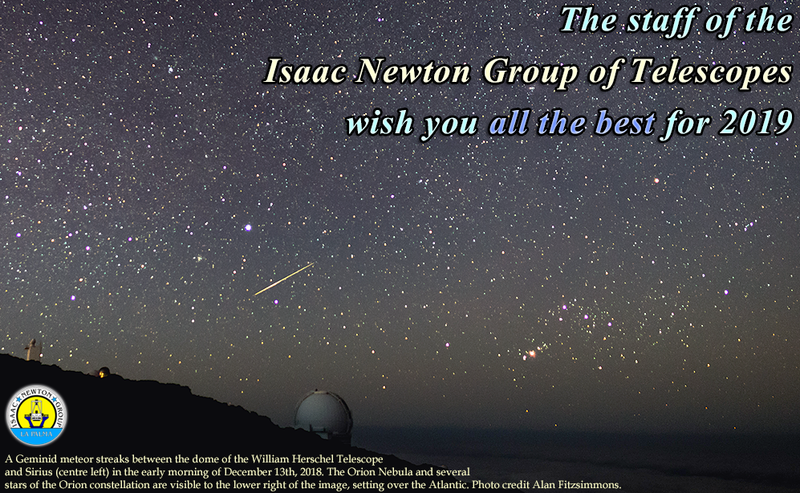 6 May 2003.Acuerdo entre el Instituto de Astrofísica de Canarias y el Grupo de Telescopios Isaac Newton. IAC Press Release. 9 April 2003. Astronomers find "naked" galaxies, devoid of dark matter. NAM Press Release. 9 April 2003. Stellar census detects more red and brown dwarfs. NAM Press Release. 27 March 2003. Spectacular Views of an Exploding Star. ING Press Release. 21 February 2003. First light on LIRIS, a new infrared spectrograph and imager for the WHT. IAC press release. 2 February 2003. The ING is selected to receive the Griffith Observatory Star Award for excellence in promoting astronomy to the public through the WWW. 31 January 2003. The William Herschel Telescope Finds the Best Candidate for a Supernova Explosion. ING press release. 27 January 2003. 2001 and 2002 ING scientific highlights available online. 9-11 January 2003. NAOMI Adaptive Optics Workshop organised by ING. 6 January 2003. A giant stellar structure surrounding the Milky Way. RAS press release based on data from the INT WFC. 11 December 2002. Prestigious European Award for Gamma-Ray Burst Research Team. ING telescopes have played a crucial role in this research. 23 November 2002. Anatoli Karpov visits the William Herschel Telescope. 20 November 2002. ING Astronomer Chris Benn plays against Anatoli Karpov. 6 November 2002. Press clippings now online. 1 October 2002. ING Newsletter No. 6 available online. 4 September 2002. A SHARPER LOOK AT NEAR EARTH ASTEROID 2002 NY40. ING Press Release. 4 August 2002. JKT image of M92 globular cluster printed in Sky and Telescope 2003 calendar. 24 July 2002. 100 Photographs in the Blink of an Eye. PPARC Press Release on first light of new instrument Ultracam. 27 June 2002. Photos of the Symbiotic Stars Probing Stellar Evolution conference. 30 May 2002. Open Days: 14 July and 15 August. 30 May 2002. Charla Divulgativa "¿Por qué todo es simétrico?" (in Spanish). 27-31 May 2002.Symbiotics Stars Probing Stellar Evolution, a conference organised by ING. 24 May 2002. ING Organises a Conference on "Symbiotic Stars Probing Stellar Evolution", from 27 to 31 may" (in Spanish). 20 May 2002. Astronomers Ponder the Nature of an Ultracool Object in Orion, using INGRID on the WHT. 16 May 2002. The INT and the JKT parts of a Global Telescope to Observe Ringing Star. 13 May 2002. The WHT proves that Cannibalistic Stars hold clue to Big Bang. 15 April 2002. JKT image of M92 is considered as the best non-HST image of a globular cluster. 5 April 2002. Flares Illuminate the Secret Life of a Quiescent Black Hole. RAS Press Release. 13 March 2002. Ask an Astronomer!. Fill in the on-line questionaire and an ING astronomer will email you with the answer. 10 January 2002. ESA's new camera will revolutionise the way astronomers observe the Universe. 27 December 2001. New additions to the ING collection of Messier objects. 24, 25 November 2001. La Palmita School and Thomas Hardy School observe on the JKT. 9 November 2001. The Palmeran amateurs start organising public observations in Santa Cruz de La Palma every weekend in collaboration with ING. 29 October 2001. First results from NAOMI Adaptive Optics system in the optical ! 25 October 2001. ING Newsletter No. 5, October 2001 available on-line. 20 October 2001. Science from La Palma - Past, Present and Future, a workshop organised by ING in honour of Dr Paul Murdin. 9 October 2001. The Spanish scientific series Futuro is filmed at the WHT. 1 October 2001. Telescope Sheets. New!! 27 September 2001. TVE's Crónicas program is filmed at ING. 12 September 2001. ING New pictures and movies in ING picture archive. 9 September 2001. ING Open Day from 09:00 to 15:30. 29 August 2001. New web pages on Schoolchildren and students visiting ING. 27 August 2001. BBC's Final Frontier visits ING again for a new programme. 23 August 2001. New collections of astronomical images: High-quality Images, Messier Objects and the Hubble Sequence. 20-23 July 2001. Final Frontier filmed at ING. Shown on BBC2 on 3 and 10 August. 15 July 2001. Open Days at ING from 09:00 to 15:30. 11 July 2001. S-Cam, The World's Most Advanced Optical Camera, Captures Eclipse of Binary Star. ING Press Release. 9 June 2001. Visit of the Spanish Ministro de la Presidencia to the WHT. 9 June 2001. Available on-line: Photos of the central kiloparsec of startbursts and active galactic nuclei conference. 7-11 May 2001. First scientific conference organised by ING: "The central kiloparsec of startbursts and active galactic nuclei: The La Palma connection". 4 May 2001. 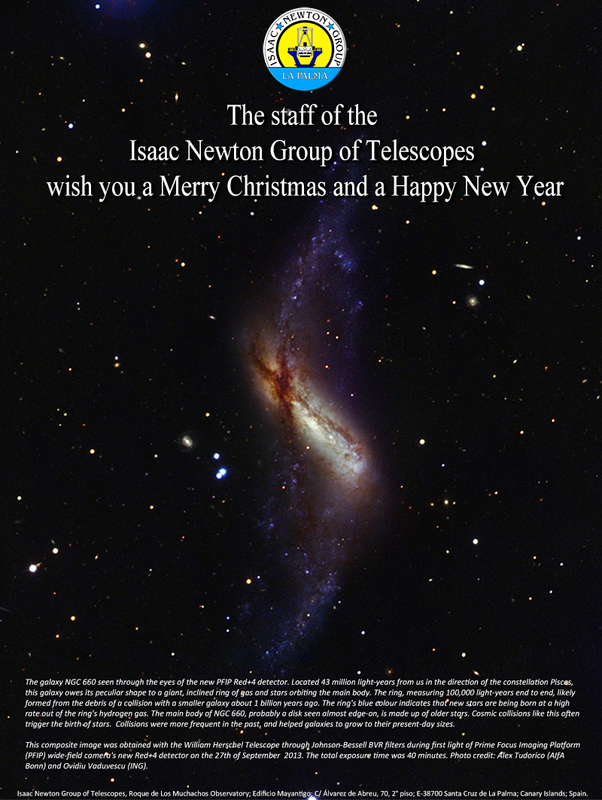 The Isaac Newton Group of Telescopes Hosts a Conference on Active Galaxies. (Spanish version). ING Press Release. 24 April 2001. The ING on-line picture archive re-organised and enlarged. 5 April 2001. Discovery of a black hole in Milky Way's Halo (in Spanish). IAC Press Release. 2 April 2001. 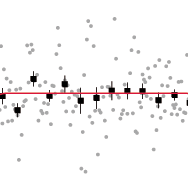 From observations with CIRSI on the WHT and the INT astronomers discover that distant galaxies are in the red. RAS Press Release. 9 March 2001. Astronomers using the INT find evidence for Milky Way galactic cannibalism (in Spanish). IAC Press Release. 27 February 2001. ING astronomer zooms in on bar of NGC 2903 using the HST. ESA Press Release. 19 January 2001. The INT discovers a new dwarf galaxy in Cepheus. 14 January 2001. ING Annual Report 1999 available on-line. 4 January 2001. Observations of a Completely Dark Galaxy from the INT Wide Field Survey help astronomers to predict that these galaxies may outnumber the normal galaxies. RAS Press Release PN 01/01, 4 January, 2001. 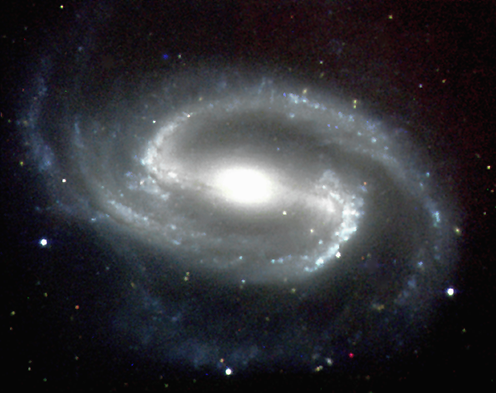 Picture of UGC 10214 galaxy interacting with dark galaxy. 12 December 2000. Public Relations Annual Report 1999 available. 3 December 2000. ING Scientific Highlights in 2000 available (preliminary version). 21 November 2000. NOVA TV series presents the "Runaway Universe" about the accelerating expansion of the Universe on the American PBS. 13 November 2000. ING Scientific Highlights in 1999 already available on-line. 30 October 2000. 'Blue Peter' filmed at ING shown on BBC One. 5 October 2000. Birth of Lonely Giant Planets Observed by the Isaac Newton Telescope. IAC Press Release. 27 August, 10 September and 17 September 2000. ING Open Days. 5 September 2000. ING Newsletter No. 3, September 2000 available. 5 August 2000. New Evidence that Galaxies Formed Early in the History of the Universe. IAU General Assembly Press Release. 20 July 2000. Southampton astronomers find 10 billion billion billion megaton bomb using the INT. RAS Press Release. 1 July 2000. The BBC programme 'Blue Peter' is filmed at the WHT. 29 June 2000. "Invisible" Galaxies, Distorted Arcs and Galactic Rings Revealed by First Images from INGRID. 1 June 2000. The Prince of Spain, SAR Don Felipe de Borbón, visits the WHT and lays the first stone of the 10-m GTC telescope. 29 May 2000. New web pages on-line: ING movies, new picture gallery of the Universe. 7 April 2000. ING participates in the exhibit "20 years of Astronomy in the Canaries", Santa Cruz de La Palma, 7 April-11 June. 20, 21 March 2000. The William Herschel Telescope is filmed for Expo Hannover 2000. 17 March 2000. Live connection with the WHT on the course of a lecture about Information Technology given by Prof John Taylor (Director of Research Councils) at the Royal Institution, London. 16 March 2000. Successful First Light on INGRID, the ING infrared camera. 15 March 2000. The Milky Way was Formed in a Record Short Time. 1 March 2000. ING Newsletter No. 2, March 2000 on-line. "Tonight on the William Herschel Telescope" is a course given by Dr Rob Jeffries, starting on 29th February in the Department of Physics, Keele University. 11 February 2000. 200th anniversary of the day when the famous astronomer Sir William Herschel discovered infrared rays.